Product prices and availability are accurate as of 2019-04-22 21:46:34 UTC and are subject to change. Any price and availability information displayed on http://www.amazon.co.uk/ at the time of purchase will apply to the purchase of this product. Ã£Â€ÂBest choice for beginnerÃ£Â€Â': 3 Selectable Frequencies Let You Fly Up To 3 Helicopters At Once. 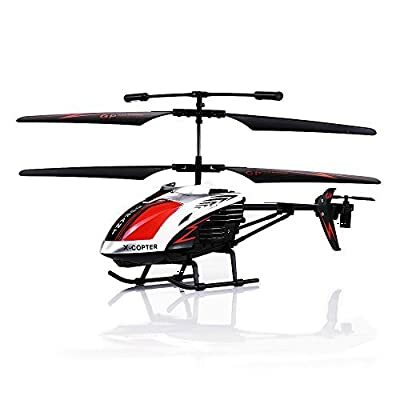 ;Ã£Â€ÂHelicopter DimensionÃ£Â€Â':10.03 x 1.97 x 4.53(inches), Larger than Other Helicopters which are the same price. Stable Flight Characteristics, Can Fly Both Indoor and Outdoor, Multicolored LED lights Allow You to Fly It in Dark night. ;Ã£Â€ÂFull 3.5 ChannelsÃ£Â€Â':Up, Down, Left, Right, Forward, Backward, Hovering. With Gyro Stabilizer, Moves More Flexible and Stable. ;Ã£Â€ÂReady to flyÃ£Â€Â':Amazing Technology in the palm of your hand! Durant RC Helicopter, No Assembly required, Ready To Fly! Equipped with the latest Gyroscope technology. ;Ã£Â€ÂWarningÃ£Â€Â': Suitable for ages 14+. Flight time up to 8 minutes while charging time only 30-50 minutes, USB charger, can Charging through Computer, Adapter, Controller. Remote control distance: 15 meters. ROHS, FCC and CE Approval.